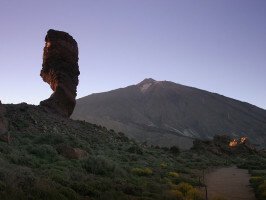 The National Park at Cañadas del Teide is a must-see location for anyone visiting Tenerife. Don´t miss an unforgettable day in a unique natural setting. 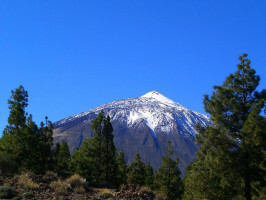 The adventure begins with the ascent to the magnificent Cañadas del Teide National Park, passing through the village of Chío where you’ll be able to enjoy spectacular views of the Chinyero volcano, the last on the island to erupt, back in 1909. 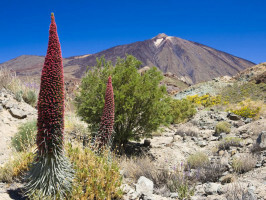 Along the winding road there will be stops at several points for you to admire spectacular views of this majestic landscape, the result of the eruptions of the Teide volcano, incidentally, the highest point in the island at 3,718 metres above sea level and recently declared a Unesco Natural World Heritage Site. Be amazed at the changes in the landscape as you climb in altitude; plantations of semi-tropical fruit give way to fragrant pine and cedar forests before you reach a lunar landscape where the only inhabitants are lava and rocks of all imaginable hues. You will also be able to enjoy beautiful views of the magnificent Pico Viejo before losing yourself in the amazing Ucanca plain where you will have time to photograph the beautiful Roques de Garcia and visit the Parador at La Roca. 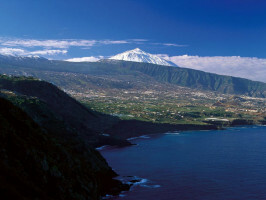 Lonely volcanic moonscapes, fragrant forests and picturesque traditional villages all await you on this one-day tour.